Finger Lakes Skaneateles NY Cottages . Looking for a tranquil getaway? Fresh air and clear waters? Try one of the Prentice Cottages on the east side of Lake Skaneateles. 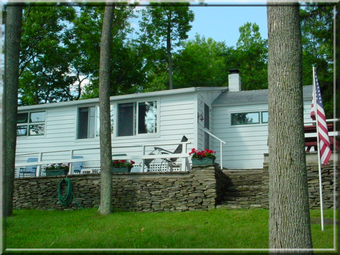 These cottages were built in the 1930's through 1950's and retain the charm of the area. Each cottage has a well equipped kitchen, bathroom, living area, bedroom(s) outdoor grill, porch or deck, air conditioning and many of the amenities of home. Wendy's Nest, is a two bedroom cottage with a relaxing front porch. Around the corner on the water is Lakeside which sleeps 6. Lakeside offers a gorgeous view from the deck and steps which lead down to 50 feet of lake frontage that includes a private dock with a swim raft. Nearby activities include golf, hiking, biking, antiquing plus fabulous dining and shopping in the charming village of Skaneateles - just 7 miles away. Come visit ... we promise it will be a magical experience, just as it has been for our family for 5 generations.